Imphal, November 09 2017: High Court of Manipur Acting Chief Justice N Kotiswar and Justice Kh Kobin flagged off a motor bike rally themed ‘Connecting to drive” from Khwairamband Keithel to Churachandpur, to spread legal awareness and message of National Legal Service Day, today morning. N Kotiswar along with Kh Kobin and Judges of Subordinate Courts of Imphal East and Imphal West, H Chandrajit, president of All Manipur Bar Association, members of AMBA, Registrar General High Court of Manipur, Para Legal Volunteers and Advocates attended the event which was organised by Manipur State Legal Service Authority in collaboration with District Legal Service Authorities of Imphal West, Bishnupur, Churachandpur and Motor Corps Manipur . Speaking to media persons before flagging off the rally, N Kotiswar said that the rally has been organised to spread legal awareness to the people as well as the message of National Legal Services Day . 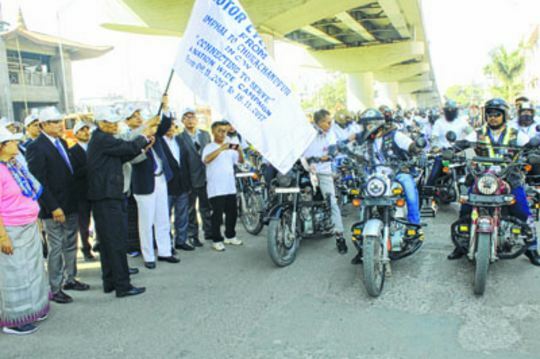 More than 70 bikers of Motor Corps Manipur participated in the motorcycle rally . After flagging off the bike rally, Judges of the Subordinate Courts of Imphal West and Imphal East took out a Walkathon rally themed ‘Connecting to serve’ from Cheirap Court complex and it passed through important roads of Imphal city . The walkathon was organised by Manipur State Legal Service Authority in collaboration with the District Legal Service Authority Imphal West and All Manipur Bar Association . The rally was led by Maibam Manojkumar, District and Session Judge Imphal West, Golmei Gaiphunsillu, District and Session Judge Imphal East and H Chandrajit, president of AMBA . The Judges of Imphal East and West lower Courts and members of AMBA and Court staff participated in the rally . The rally or walkathon passed through Khwairam-band Keithel, Kanglapat road, MG Avenue and concluded at the starting point at Cheirap Court complex where a legal awareness camp was also held . Speaking at the camp, H Chandrajit said that the right to legal aid is a basic human right as under Article 1 of the Universal Declaration of Human Rights . Golmei Gaiphunsillu, District and Session Judge Imphal East also spoke about the importance of knowing the basics about the Indian Law.